Much of South and West Suffolk is now subject to a hosepipe ban imposed by Anglian Water but customers in the North of the county served by Essex and Suffolk Water are not currently affected by a ban. 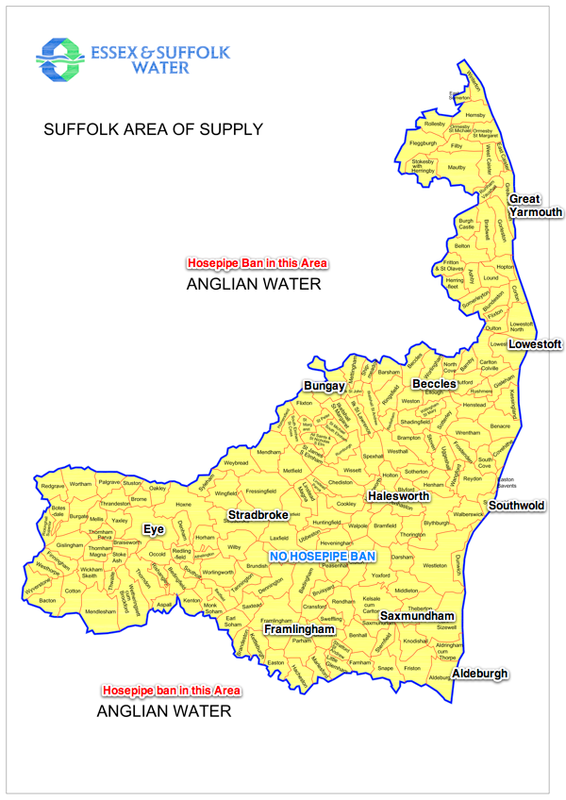 Because of the extremely dry conditions we’ve been experiencing, Anglian Water have had to restrict non-essential water use which means there is a ban on using a hosepipe. Did you know hosepipes can use up to 1,000 litres of water in just one hour? Our water resources are below average for the time of year following below average rainfall in 20 of the last 24 months (April 2012). Our resources are not currently at a level where it has been necessary to introduce water restrictions in our supply area at this time. We do not currently have a hosepipe ban. However, with it remaining so dry, the possibility of restrictions on the use of a hosepipe is becoming more likely. We will continue to monitor the water resources situation very carefully. If our resource situation worsens and we do need to introduce any restrictions, we will communicate with our customers about this with clear advice and guidance in advance. So basically if you get water bills from Essex and Suffolk Water there is not a hosepipe ban at least as yet. If you want to check if the ban applies to you then use the Postcode checker or see the map below.